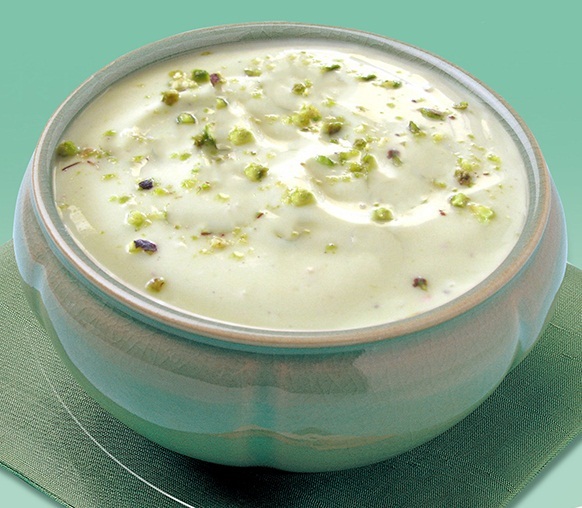 Shrikhand: Shrikhand is an Indian sweet dish made of strained yogurt. It is one of the main desserts in Gujarati cuisine and Maharashtran cuisine. Preparation of this dish is very simple but it takes some time to process yogurt properly. In Gujarati cuisine, shrikhand is eaten as either a side-dish with breads such as poori or as a dessert. It is commonly served as part of a vegetarian thali in Gujarati restaurants and is popular as part of wedding feasts. Shrikhand is served chilled. Put a muslin or cheese cloth over a strainer. Pour the yogurt over muslin cloth to drain. Place a bowl underneath the strainer to collect the strained water. Gently squeeze the excess water from yogurt. Make sure not to squeeze out the yogurt. Move the yogurt with strainer and bowl into the refrigerator for at least six hours to drain remaining water. Transfer the strained curd from fridge to a bowl. Yogurt will become thick in consistency. Add in the powdered sugar, green cardamom powder and milk to yogurt. Beat the mixture with hand or hand mixer, till the sugar is incorporated into the strained yoghurt. Shrikhand is ready to be served. Garnish the shrikhand with almond slivers and chopped pistachios. Chill the shrikhand before serving. Traditionally shrikhand is served with puri (fried flat bread). While the water is draining from the yogurt, it’s suggested to keep the yogurt in the refrigerator in order to keep the yogurt from becoming getting sour. Add dry fruits or fresh cut fruits like chiku, apple, grapes, pineapple, and mango to make a creamy fruit dessert for variation. If you are in a hurry and do not want to wait for curd to drain all water, use ready-made Greek yogurt (chakka). If you have any queries regarding the Shrikhand recipe, please leave a comment.